I'm trying to install an older nest in my condo but it immediately complains that there's no common wire attached (error e24). 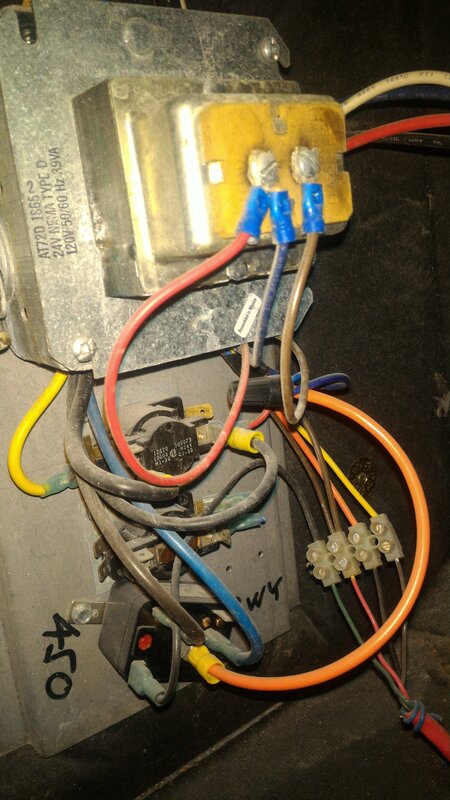 I opened up the fan coil in my condo and there is no specific terminal for the common wire. 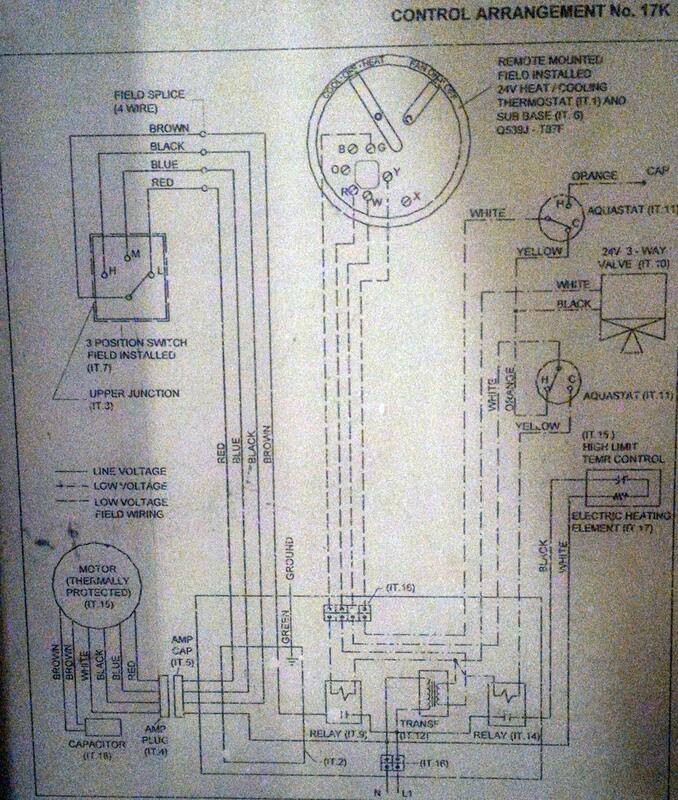 Is there anywhere on this circuit that I can connect a c wire? Some people tell me that if I hook a wire to one of those transformer terminals that will give me 24v, but others have told me that it won't work. Or would I be better off getting a 24vac adapter and connecting the wires to C and Rc? (with the R wire from the fan coil unit going to Rh). This seems like a common fix on youtube for people lacking a common wire. I'd prefer though if I can just attach a wire somewhere in the fan coil system though. Thanks! In your photos of the wiring, you'll notice a wirenut that joins orange, purple, and blue wires together. Joining the blue wire in your thermostat cable with that wirenut will give you a blue C wire at your thermostat. Why, you may ask? Well, the wire that connects to the green G thermostat wire at the thermostat terminal block goes to one coil terminal on the relay at the bottom (you can just make out the bottom relay's terminal diagram in the bottom photo). The other coil connection on that relay, then, must connect to C to complete the circuit from transformer, through thermostat switch, through relay coil, and back to the transformer again. Lo and behold, the other relay coil connection is the orange wire, which goes up into the wirenut in question, which is then connected back to the transformer via the purple wire. 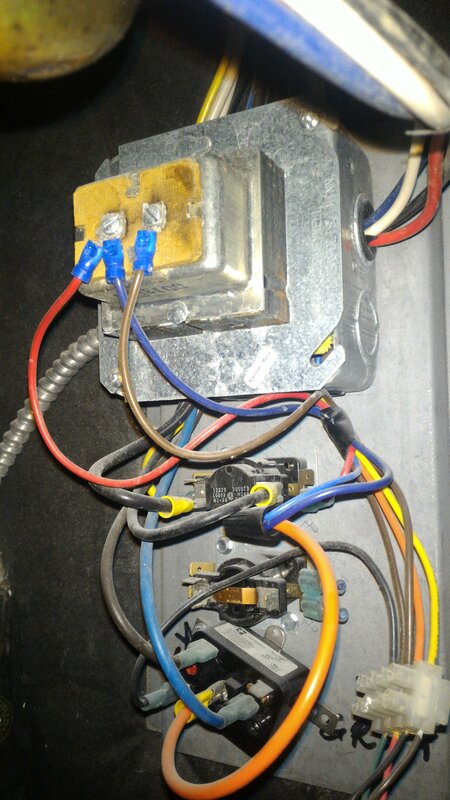 Furthermore, the red R wire at the thermostat terminal block connects to a pair of brown wires there, and one of them runs off to the other transformer terminal, relative to the transformer terminal that the purple wire connects to. So, we have our C wire connection, in the form of a conveniently placed wirenut even. Not the answer you're looking for? 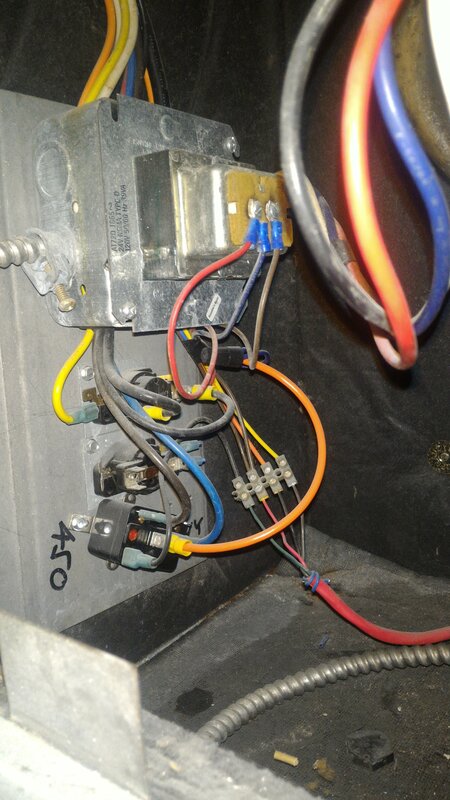 Browse other questions tagged hvac thermostat thermostat-c-wire nest or ask your own question.